Tube-driven metal tone made for practice and recording. 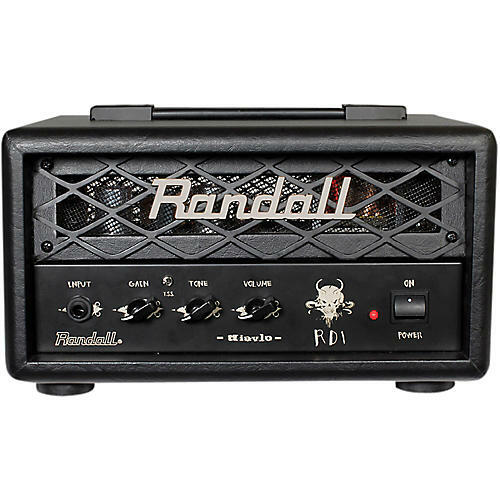 The Randall RD1H Diavlo 1W amp head gives you real high-gain tube tone made for the most face-melting metal, and presents it in a portable size and practice-friendly volume. It features controls for Gain, Volume and Tone - as well as a Tone Stack Shift, a three-way midrange frequency variance switch to switch among full-bodied lead tones, rock and scooped metal. The back panel of the ruggedly built head houses the Class-A discrete FX loop, XLR speaker-emulated output for recording or PA-direct sending and 4Î speaker output. Dimensions: 12.2" x 8.6" x 6.9"